The HP 4100N is a very reliable personal / small workgroup printer. We have upgraded this printer to include our PrinterTechs premium feed rollers, which provide 2.5 times the grip of standard feed rollers! It comes standard with 32 MB RAM, an HP JetDirect card for connecting to a network, and one 500-sheet tray. Upgrade options include features like duplexers and extra trays. Other models in this series include HP LaserJet 4100 , HP LaserJet 4100TN , HP LaserJet 4100DTN. HP part number is C8050A. The LaserJet 4100N is the speedier successor (25 pages per minute) to the very robust HP LaserJet 4050. This is a great printer for personal use or small workgroups. It comes standard with 32 MB RAM, an HP JetDirect card for connecting to a network, and one 500-sheet tray. 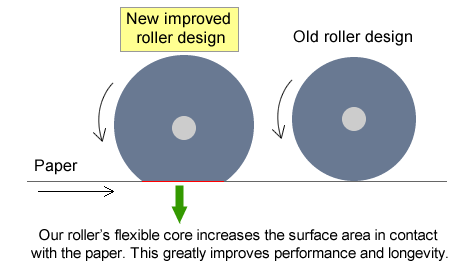 Our Premium Rollers have 2.5 times the grip! 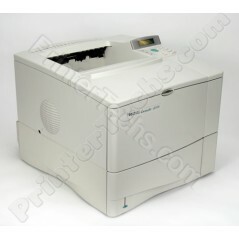 PrinterTechs Laserjet 4100N printers include upgraded parts: premium feed rollers which have a flexible core. This provides better paper grip and greatly improved longevity. Approximately 2.5 times the grip of standard feed rollers! 13.5" x 15.4" x 19.9"